Enjoy the charming historic community of Niagara-on-the-Lake on the shores of Lake Ontario at the mouth of the Niagara River – a popular getaway destination. Bob and Julie Bonnell invite you to come aboard and relax in their comfortable, spacious home in “Old Town”. We are close to art galleries, shops, restaurants and the live theatre experience of the Shaw Festival. Located on a major wine route, many award-winning wineries, antique shops, and golf courses are just minutes away. Watch sunsets on Lake Ontario just a 10-minute walk away. Cycle or rollerblade on the numerous bike paths. Tour Fort George, Laura Secord’s homestead and other historic sites of the War of 1812. Watch the big ships go through the locks on the Welland Canal in nearby St. Catharines. The many attractions of Niagara Falls are a short 20-minute drive away. Built in the latter part of the last century, The Brass Bell Bed and Breakfast is named after the ship’s bell of sea-going vessels. Thus the decor is a mix of contemporary and traditional styles with a light nautical touch (Bob is a retired Navy Commander.). The soft, melodic chimes of the ship’s clock will call you to a full sumptuous breakfast featuring Niagara’s fruits (in season), home-baked goods, homemade wine jellies, main courses such as specialty French toast, Dutch babies, specialty waffles, frittatas, or quiches. Take your morning coffee on the veranda. 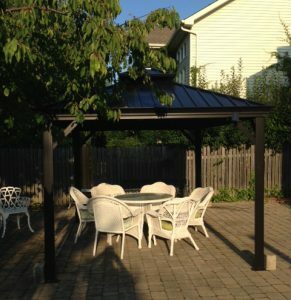 Relax in the backyard gazebo, sip wine in the afternoon and enjoy the gardens. Complimentary bottled water and soft drinks are available both in the upstairs lounge and downstairs in the fridge outside the Captain’s Quarters. Our home is adult-oriented, fully air-conditioned, smoke-free and pet-free (due to allergies). We provide numerous coupons for free tastings at many wineries and discount coupons for some shops and restaurants. We love living in Niagara-on-the-Lake, which was voted the prettiest town in Canada. Operating a bed & breakfast allows us to be ambassadors for the Niagara Region and provide our guests with the hospitality for which Canadians are renowned. We hope our guests look upon their experience at The Brass Bell Bed and Breakfast as a pleasant one and will return to the region time and time again. We are pleased to be members of the Niagara-on-the-Lake Bed and Breakfast Association, the Niagara-on-the-Lake Chamber of Commerce and the Niagara Historical Society.